Want a healthy snack that won't raise your sugar or add on the fat. a great taste that will make you want to make some more. powder, 1 tablespoon maple syrup, and vanilla extract. Stir until combined. I used a small dessert fork and it worked perfectly. 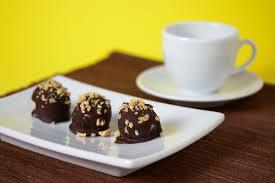 the truffles in the freezer for an indulgent treat anytime! *You can sprinkle crushed nuts for added taste & protien.